Home > Education > What is open-cut mining? Typical Open Cut mining in PNG. Most of the products we use every day, for example; mobile phones, televisions, computers and cars are made out of valuable minerals and metals found in rocks that were mined from near the earth’s surface. 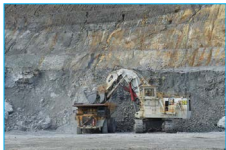 This rock material that contains sufficient valuable minerals and metals and is mined from the ground is called ore.
Open-cut mining or surface mining is a technique used to extract ore located close to the surface and is the most common method of mining. Open-cut mines are used when deposits of commercially useful minerals or rock are found near the surface and where the overburden (surface material covering the valuable deposit) is relatively thin or structurally unsuitable for tunneling. Open cut mines that produce building materials and dimension stone are commonly referred to as quarries. remove ore, waste and other materials, but also practical limitations, like flooding can slow progress until the mining costs exceed the value of the metals extracted, and then the mine will close. Copper, gold, iron, nickel, silver and zinc are some of the metals recovered from open-cut mining. Although not a metal, coal is a major commodity that is also extracted using open-cut mining. Valley Gold Mine, Ramu Nickel and Simberi Gold Mine.